Ok, let's not judge this one by its cover. These guys do not exactly look like happy jazzers, but crack the CD open and listen, this is intense music, vivacious, vigorous, and full of lively twists and turns. Happy Jazz delves into free improvisation with zeal, electric guitar lines snake around expressive bass work while bass clarinet melodies range from sonorous to squelching. The total sound is replete with possibilities and the trio explores them all. 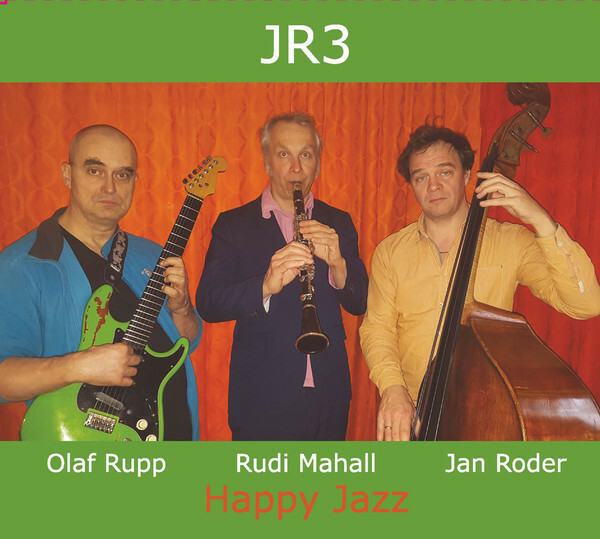 JR3 is named after Jan Roder, the bassist in this Berlin-based trio, along with bass clarinetist Rudi Mahall and guitarist Olaf Rupp. All renowned members of the European experimental music scene, it is exciting to hear their restless music on the adventurous Relative Pitch label. The title track begins with a gentle melody introduced by Mahall and soon accompanied by crisp atonal sweeps and crunchy tonal clusters from Rupp. In his more brittle moments, the guitar work is slightly reminiscent of Derek Bailey, but Rupp has a textural approach that is all his own. Roder, via elongated bowed notes and rapid pizzicato flights, connects the musicians with aplomb. The group's close listening and lightning fast reactions are exemplified in the track 'Das Bildnes Der Doris Day'. Beginning with quick burst of activity from Rupp and a sizzling stream of notes from Mahall, the musicians seemingly go off in separate directions, yet always remaining tightly connected, finding ways to hook into each other's musical tangents. Another highlight, especially for the guitar fans, is 'Arm durch, Kopfuber', where Rupp can be heard dropping chord shards and spicy counter-melodies to Mahall's zig-zagging bass clarinet lines. His blustery scampers around the fret board is mesmerizing. Roder's solo, as much as it is a solo and not just the song, scratches, stretches, and slides about while Mahall loops around with bubbly melodic lines and hackle-raising squawks. Happy Jazz is a really great document of contemporary free improvisation coming out of Berlin. It isn't always an easy album, but it is happy: the joy of playing, experimenting, and creating really shines through. Relative Pitch finds great combinations of experimental artists that work well together! Nice job, once again.